Compare to mono-layered cultured cells, spheroid has similar structures and functions as tissues in living organisms. So spheroid is getting common for a lot of researches , such as drug discovery and toxicity assay. HeLa-Azami cells were seeded on 96well plate (Corning#4520)with200cells/well condition and cultured O/N, following time-lapse imaging analysis for three days using CV7000. 11 Z-slice images were created as a MIP(Maximum Intensity Projection) 2D-image to quantify area of spheroid. The graph (D) shows a spheroid area at indicated time-points. 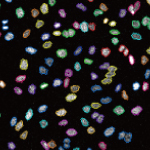 While live cell imaging is a powerful tool to analyze biological changes in detail, behaviors of individual live cell could be different even under the identical culture/imaging conditions, thus, it is quite useful to track and analyze each cell to obtain accurate analytical results. 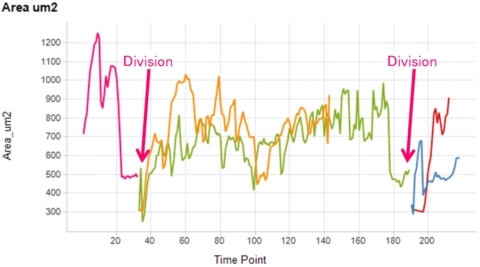 With the CV7000 “Tracking Analysis” algorism, it is possible to individually track behaviors of many cells over time and quantitatively analyze the data based on various parameters. 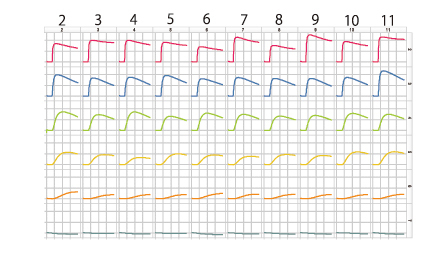 Long term cell tracking enables cell lineage analysis, too. Because of the hydrophobicity of the lipid bilayer of cell membrane, polar molecules are not able to cross cell membrane. It is crucial to keep concentration gradient of solutes between cytosol and extracellular fluid, or intracellular organelles surrounded by membrane. There are many transporter proteins in the cell membrane, which transport polar molecules such as ions into or out of the cells, or intracellular compartments surrounded by membrane. In the case of eukaryote, even when exposed to very high Ca2+ concentration such as 10-3M, cytoplasmic Ca2+ concentration can be kept at as low as 10-7M, while free Ca2+ concentration inside the cytoplasm greatly increase as a result of only a small amount of Ca2+ influx into a cell. Since Ca2+ influx into a cell depending on extra-cellular signals and being enabled by steep concentration gradient is one of the most important way of signal transduction, keeping the concentration gradient of Ca2+ is very important for the cells. 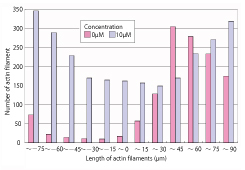 Ionomycin is an ionophore which is hydrophobic and can dissolve into the lipid bilayer, and thus is effective to enhance membrane permeability of Ca2+. 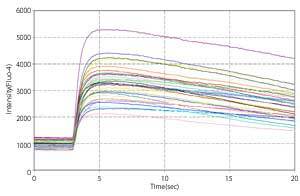 Here we present an example of the analysis of changes in the intracellular Ca2+ by Ionomycin, by using “Sequential fluorescent intensity analysis” function of the CV6000. Fig. 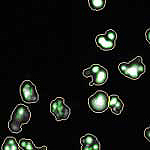 1 - Changes in the intracellular Ca2+ concentration of each cell in A-1 well. 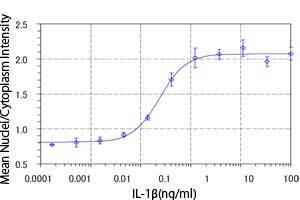 You can confirm increase in the intracellular Ca2+ concentration right after Ionomycin addition. 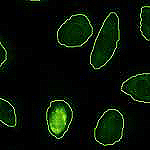 (e) Changes in the intracellular Ca2+ concentration of each cell. 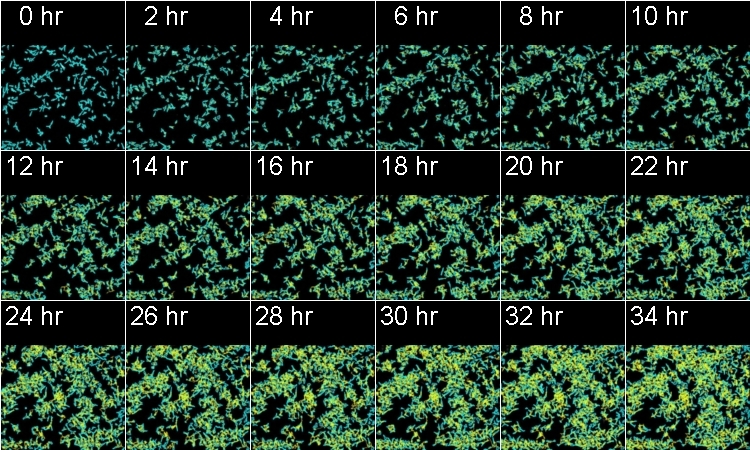 By correlating all time-lapse images of each cell, it is possible to analyze the changes in each individual sell, and thus it is possible to detect cells which show specific characteristics. 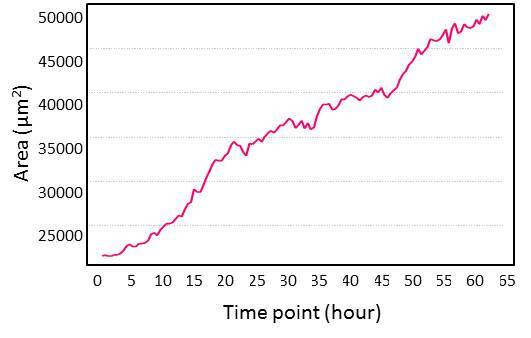 This graph shows time-lapse data of the average fluorescent intensity per well. It is possible to dispense different drugs and/or dosage into each well, which could be useful for comparative analysis. 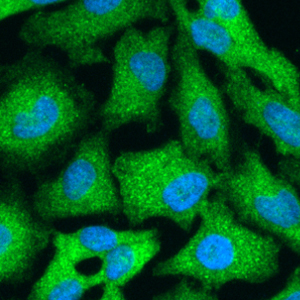 Analysis of the changes in the intracellular Calcium concentration is one of the most important analytical factors in such research area as intracellular signal transduction and muscular contraction. 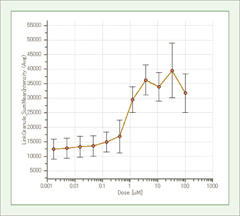 Here we present an example of CV6000 analysis of the Ionomycin-dose dependent changes in intracellular Ca2+ concentration, by using A10 cells loaded with a Calcium dye, Fluo-4, and adding various dosage of Ionomycin,a Calcium ionophore. 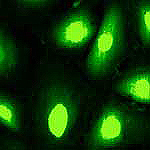 (a) Averaged fluorescent intensity of individual cell within each well. 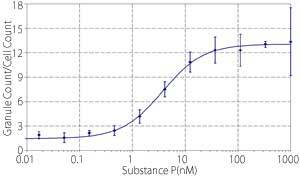 (b) Averaged cellular fluorescent intensity pf each well. 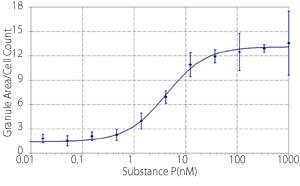 (c) Averaged cellular fluorescent intensity as shown at each Ionomycin dosage. 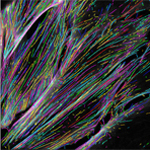 The Cytoskeleton provides the cell with structure and shape and plays important roles in both various intracellular transport and cellular division. The eukaryotic cytoskeleton is composed of microfilaments, intermediate filaments and microtubules. 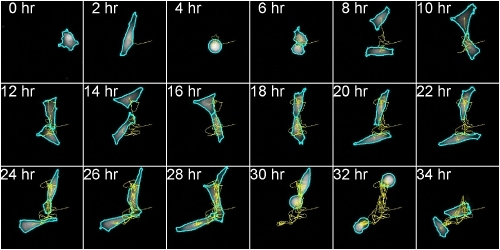 There is a great number of proteins associated with them, each controlling a cell‘s structure by directing, bundling, and aligning filaments、thus significant changes in the status of microfilaments,; such ａｓ total number, length, distibution, movement or stability could be observed after drug stimulation. 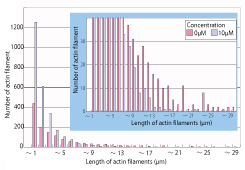 Here, we present an example of cytoskeltal morphology analysis through the observation of fluorescently stained actin, one of major proteins to construct microfilaments. 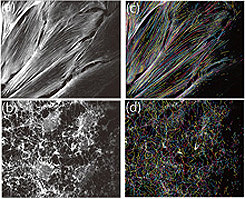 A-1, B-1: Raw image, A-2, B-2: Recognition of Cytoskeleton. GPCR, it will be internalized When a ligand binds tointo cytoplasm from cell membrane to form endosome. 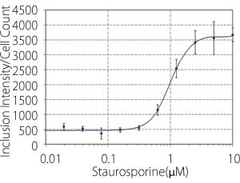 You can measure degree of GPCR Internalization by using such parameters as granular count in endosome and total area of endosomes. Fig. 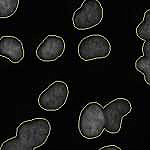 1 Images captured by CellVoyager6000. 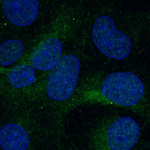 By using CV6000 “Nuclear Translocation Analysis” algorism, translocation of proteins between cytoplasm and nuclei can be analyzed multilaterally. 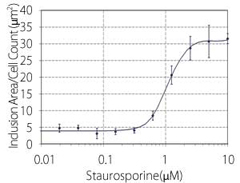 Here is an example of the analysis of NFκB translocation after cytokine stimulation. 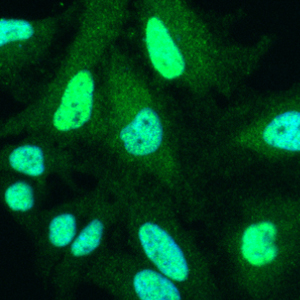 Superimposed images of Hoechst33342(nuclei) and Alexa488（NFκB） are shown. 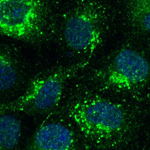 (a) Ratio of the cells whose total granular area on the cell membrane is higher than 160 (Green), at each PMA dosage. (b)Ratio of the cells whose total fluorescent intensity of the granules on cell membrane is higher than 240,000(Green), at each PMA dosage. 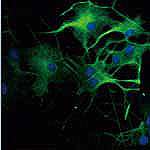 CV6000 “Neurite Outgrowth Analysis” algorism is to measure neurite outgrowth by analyzing morphological changes in neuronal cells and quantitate neurite formation, composition and behavior in response to chemical agents and growth conditions, which is useful most typically for neuronal cytotoxicity assay, and for many neuropharmacology research and screening in relation to neuropathological disorders and neuronal injury/regeneration. 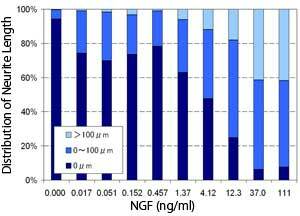 By using CV6000, individual cell data in each well can be acquired, which enables detailed evaluation of compounds targeting at neurodegenerative diseases. 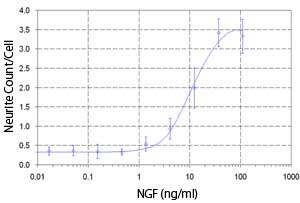 Here is an example of the analysis of neurite outgrowth after NGF stimulation of PC12 cell, which is a widely used neuronal cell model originated from adrenal medullary pheochromocytoma. 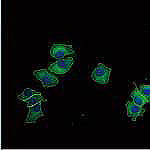 Fig.1 Images captured by CellVoyager6000. (a) Raw image before NGF stimulation. (b) Raw image after NGF (111ng/ml) stimulation. 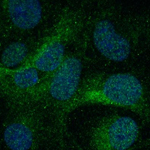 Superimposed images of Hoechst33342 (nuclei) and Alexa488 (β-TubulinⅢ) are shown. 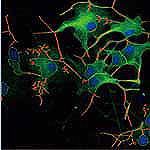 (a) Dose response of neurite count per cell. 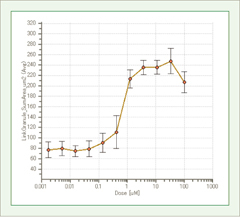 Similar dose response curves can be acquired for multiple parameters such as neurite length and branches. 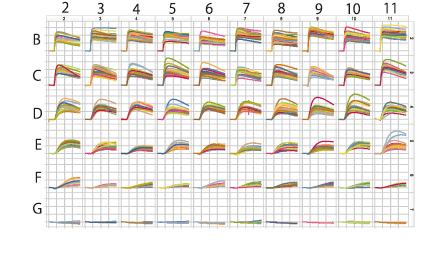 (b) Distribution analysis of neurite length of each individual cell at each NGF dosage. 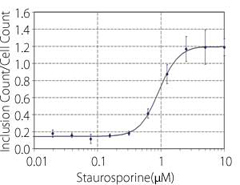 It is possible to analyze individual cell data for each parameter like this graph. Under apoptosis, you may observe various phenomena under microscope, such as changes in plasma membrane, Cytochrome-C release, morphological changes such as DNA fragmentation, and behavior of some specific proteins such as caspase. 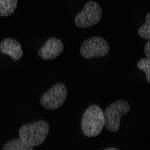 “Nuclear Morphology Analysis” protocol uses DNA aggregation or fragmentation as parameters for apoptosis analysis. 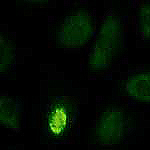 Measurement of the nuclear DNA level is one of major cell cycle analysis methods, and fluorescent imaging after staining nuclei with DNA dyes such as Hoechst33342 is a simplest way to measure the DNA. If the DNA level at “G1 phase” was 1, it doubles at “S phase” due to DNA synthesis, and thus reaches at 2 at “G2 phase”. 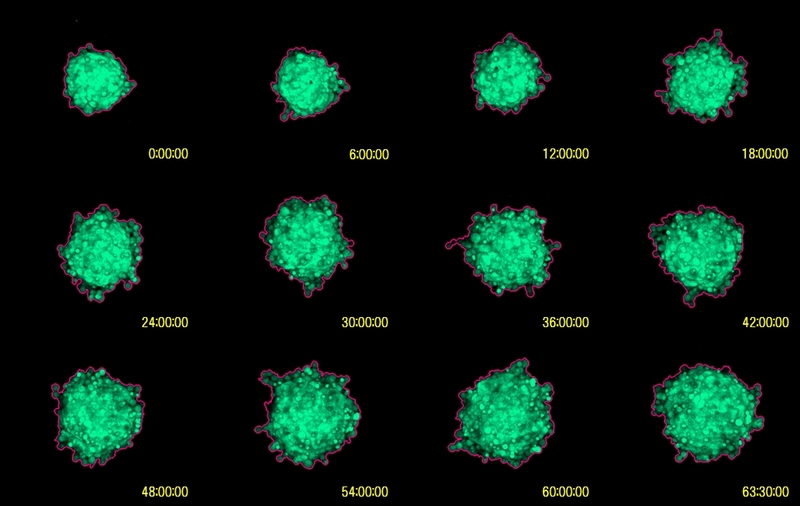 Here is an example of Cell Cycle Analysis In HeLa cells by using the CV6000. To enable data analysis to cover a wider area within each well (Fig. 1). 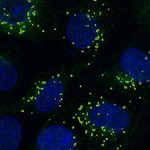 Nuclei were recognized by “Nuclear Morphology” protocol (Fig.3). 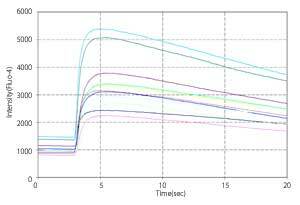 CV6000 analysis software has “Feature Range Filter” function which groups objects by confirming each image. 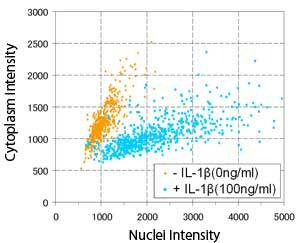 Here, cell cycle grouping was done based on the fluorescent intensity histogram（Fig.4) Numerical data such as total fluorescent intensity which corresponds to nucleus area and DNA level of each cell, and maximum fluorescent intensity were calculated. 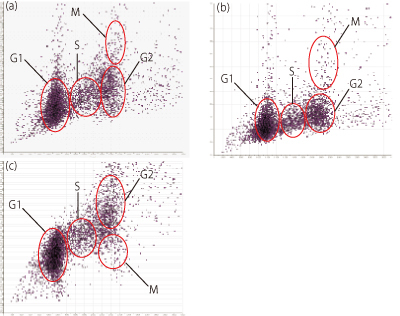 Grouped data were summarized by “Feature Range Filter” function, and shown as scatter diagram which may indicate each cell cycle group. 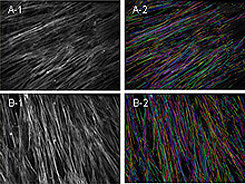 (Fig.1) 4 each images per well were captured and analyzed as one image by the CV6000 analysis software. (Fig.2 a,b,c) Scatter diagram based on each single cell in which X is “Total Intensity” and Y is “Mean Intensity”. Cell Voyager 7000S (CV7000S) is a high content screening system with our original confocal scanner unit, a live cell stage incubator and a build-in liquid handler which enable long term live cell imaging and rapid kinetic analysis. CV7000S is the most powerful microscopic system for drug discovery based on phenotypic screening as well as life science researches.